IT’S OUR 55TH YEAR AND WE ARE CELEBRATING! Where do the years go? 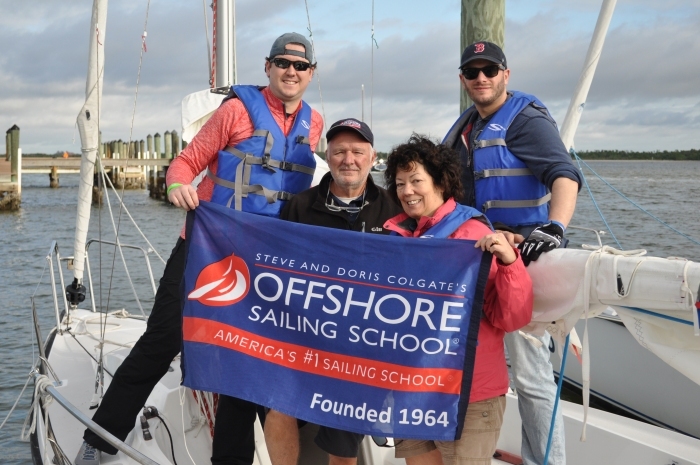 Steve Colgate started Offshore Sailing School on the back of a cocktail napkin in November 1964. He taught classroom sessions in an office on 40th Street in Manhattan, and on-the water sessions on City Island, NY, a tiny maritime island (at the time) in the Bronx. He had no idea then it would become the largest independent sailing school in the United States, with the broadest range of hands-on courses at multiple locations. 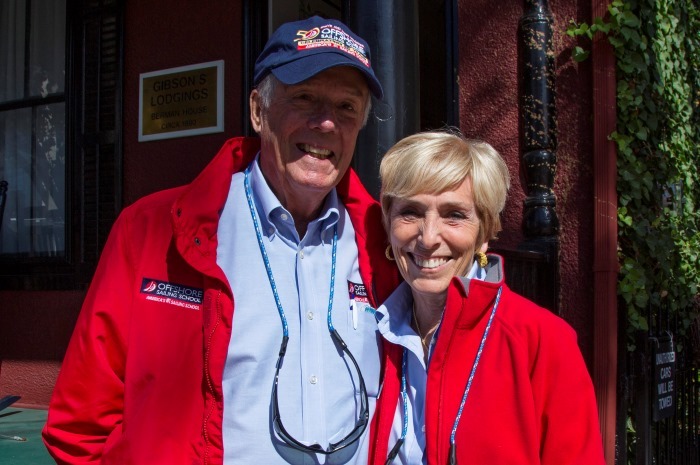 Doris met Steve in January 1968 when she took a racing course he ran in the Bahamas. A year later they were married and have been joined at the hip ever since – running Offshore Sailing School and loving “almost” every moment. Over the years they opened, tested, and moved on from many locations, nearly 40 in all, and have settled on six gorgeous destination resorts in Florida and the British Virgin Islands. You can read more about the evolution of Offshore Sailing School in our About Us section on this website. Offshore Sailing School will be at the U.S. Sailboat Show in Annapolis, Maryland, October 10-14, 2019. Come visit our booth on the BoatUS Bridge between H and I Docks on Annapolis Harbor to learn about our Boat Show Specials. OUR 19TH PERFORMANCE RACE WEEK IS SOLD OUT — 2020 DATES COMING SOON! This very popular program is the best learning program you’ll find for competitive sailors. We run this week in partnership with North U – whose popular director, Bill Gladstone, leads a team of coaches on the water, in seminars, and evening recaps. Performance Race Week is intense and exciting, challenging you to become a winning sailor. Up to ten boats on the line, a group of coaches that work with you non-stop, social events, and a whole lot more await you including go-fast drills, practice starts, and real racing on Colgate 26s, with just four crew per boat. 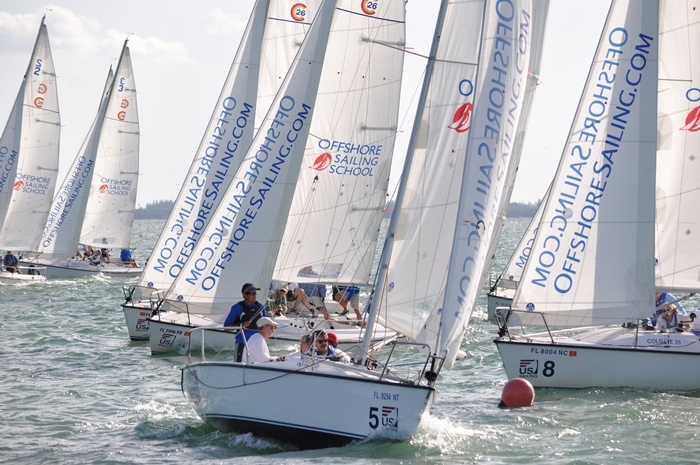 The comprehensive racing event is held in April each year, just in time to join your buddies back home as sailing and yacht clubs open for spring racing. If you are feeling rusty or haven’t raced much, we highly recommend you sign up for the Fast Track to Sailboat Racing Course. Add three days to your trip and learn all the go-fast techniques before the rest of the group arrives, then head to the winner’s circle on Regatta Day! 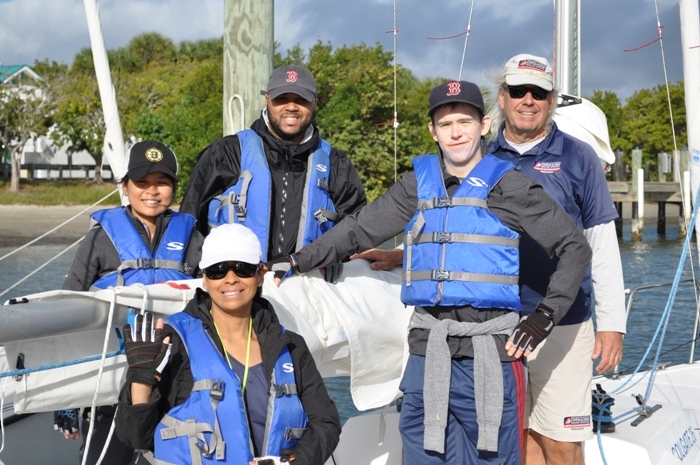 Offshore Sailing School once again hosted a group from Suffolk University’s MBA program, this time at Pink Shell Beach Resort & Marina on Ft. Myers Beach in Florida. Early December weather was brisk, in the high 60’s and mid-70’s, and loved by the 14 participants, their course leader and professors, who were shoveling snow before they left to head for a week of team building and leadership training in sunny Florida. This action-packed program filled the group’s waking hours with half-day sailing challenges and leadership classroom sessions. It was non-stop, starting with breakfast and ending at sunset with more program studies and dinner. The two photos here are of two of the four crews, each assigned to an expert Offshore Sailing School instructor/coach, well-versed in Sail-Race Challenge drills. They were invigorated, enthusiastic, tanned and tired by the end of the week, sharing sailing stories, reveling in wins, overcoming losses on the race course. Sailing is the by far the best way to bring teams together and develop leaders who will deftly guide those teams. Mistakes on the race course are turned into project sessions. Wins are examined to provide a basis for achieving goals. Offshore Sailing School can accommodate teams of 8 to 50 easily. 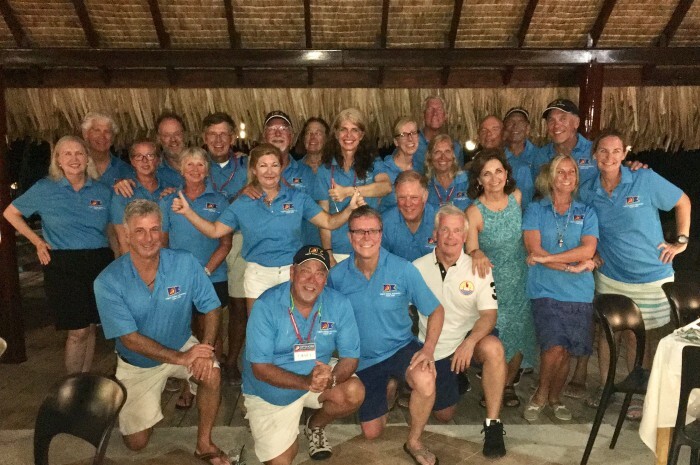 In addition to the Pink Shell Beach Resort on Ft. Myers Beach, Offshore Sailing School hosts team building and group sailing excursions at South Seas Island Resort on Captiva Island, and The Westin Cape Coral Resort in Cape Coral, Florida. 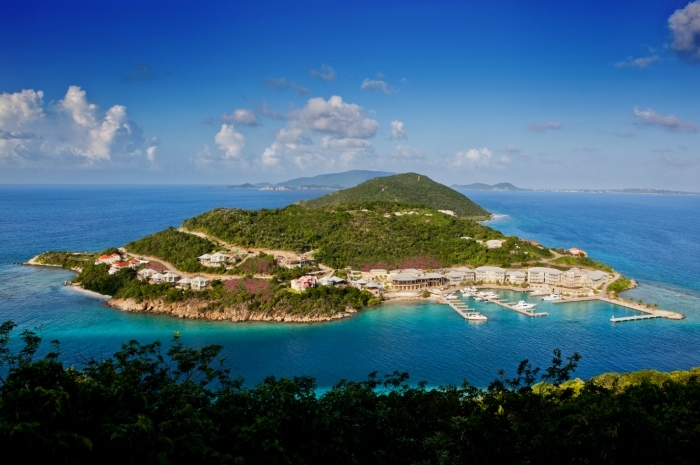 Certain size groups can also be accommodated at Scrub Island Resort in the British Virgin Islands. Contact Beth Oliver today to learn how you can make your team the best ever: BOliver@OffshoreSailing.com, 239-985-7516. Adventures Flotilla Cruises – for Offshore Sailing School grads and sailors who love to sail. Take a look at the group in this photo. They just finished the cruise of a lifetime in the gorgeous turquoise waters of Tahiti. These fabulous adventures take you all over the world. They are the most delightful, hassle free sailing vacations you’ll find. We book the boats, research and provide the itinerary, put the crews together based on friendships and sailing experience, and best of all – we provide expert tour leaders who love to sail and want you to have the time of your life! If the trip you desire is sold out, request a spot on the wait list. Openings do occur. Here’s what’s coming up in 2019. Mallorca, Spain – June 29-July 6, 2019 – SOLD OUT! Croatia: Agana-Dubrovnik – August 24-31, 2019 – ONE CABIN LEFT! Croatia: Dubrovnik-Agana – August 31-September 7, 2019 – THREE CABINS LEFT! St. Martin and the Leeward Islands – February 8-15, 2020 – JUST ANNOUNCED AND 7 CABINS SOLD ALREADY! One of our most important special activities is our Tweens and Teens Learn Free program where 7-17 year old kids learn to sail with their parents. This is an absolutely amazing experience, one that many parents say is the best way for the family to bond. 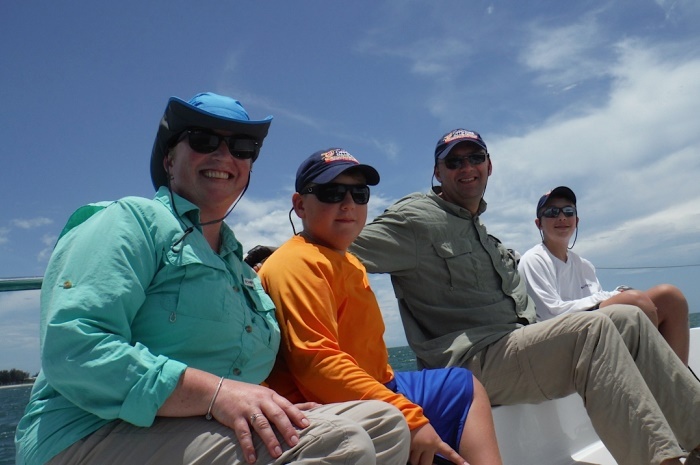 Save up to $1,000 with our Earth Day Special on family Buy-the-Boat packages in Florida. View details here. Our bi-monthly newsletter is full of interesting stories, creative specials, sailing deals, upcoming flotilla cruises, contests, and other opportunities to keep you sailing and boating. If you haven’t already, visit our Sailing Newsletter Sign-Up page. Beth Oliver, Offshore Sailing School Director of Marketing, gathers information to keep you informed, shares sailing news, develops contests, and posts photographs and experiences that come from you. Got an idea? Send it to Beth at Boliver@OffshoreSailing.com.